Sunny-sid3up was founded by Christopher Feeney, an ice-cream van driver from Pollok, Glasgow. 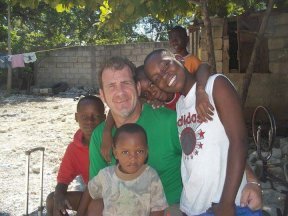 Through his job, Chris discovered his true passion; helping those less fortunate than himself. Chris's first project was to purchase a new wheelchair for a cerebral palsy sufferer. Using his ice cream van as a mobile hub for his fundraising, Chris collected glass soft drinks bottles (which at the time had a 20 pence bounty). Chris involved everyone in his humorously titled "Don't Be Stingey, Gees Yur Gingies" campaign and successfully reached his desired target. Following his first project, Chris, in his own words, "was having a bad day at work and saw an advert for fundraising for the Asthma Society which involved walking part of the Sahara Desert". Seeing another opportunity to help others while gaining a 10 day break from work, Chris booked himself on the trek. After reaching his fundraising target and completing the Sahara Trek, Chris set his sights on bigger projects. After the 2004 Asian tsunami, Chris traveled to India for his first international aid project. With other volunteers, he helped rebuild an entire fishing village that was completely destroyed by the tsunami. Inspired by his first large project, Chris went on to complete even more work in Sri Lanka, New Orleans, Mexico and Haiti. While Chris found all his trips extremely rewarding, he regularly expressed concern at the unfair and fragmented distribution of aid he witnessed. For this reason he decided to create his own registered charity and Sunny-Sid3 Up was born. Under his charity, Chris managed to complete more projects abroad before he took unwell and passed away on route home from a trip to Sri Lanka. Some years on from Chris's unfortunate passing, his charity lives on with only one small change; its location. Thanks to help from aid worker Paul Gill, Sunny-sid3up managed to finish off the projects it started abroad and is now run by Chris's family and friends, operating closer to home in Glasgow, Scotland.